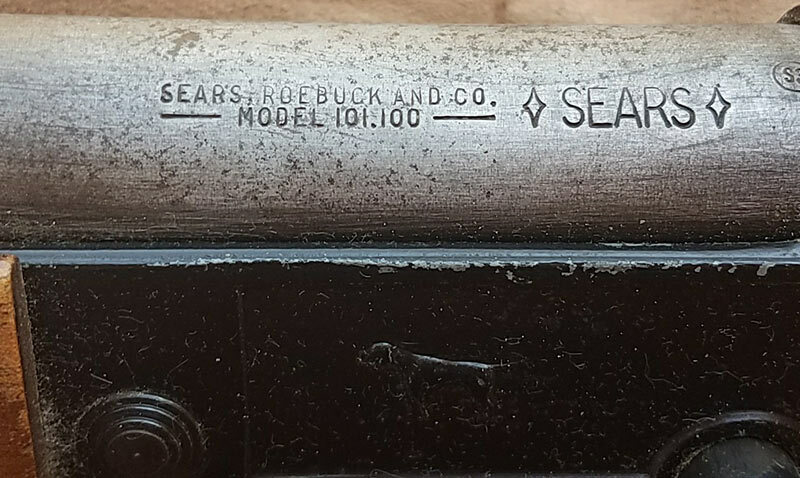 The Sears 101.100 is basically a re-badged Savage Model 96 shotgun and really isn’t worth much even in great condition. 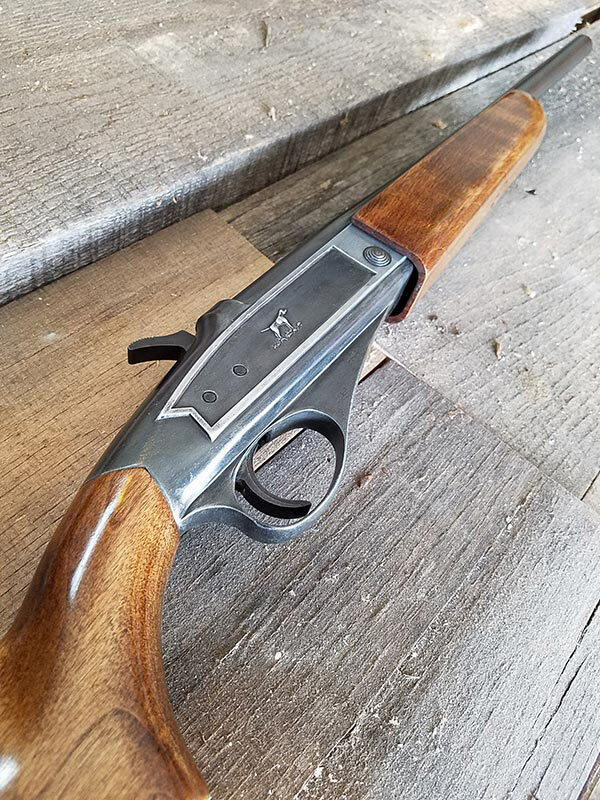 Because of this many Sears shotguns found their way into service on the farm or out in the country where they were used, and used hard. This 20ga’s story is very similar. It found it’s way to rural Texas on a ranch and stayed there culling varmints for over 50 years. 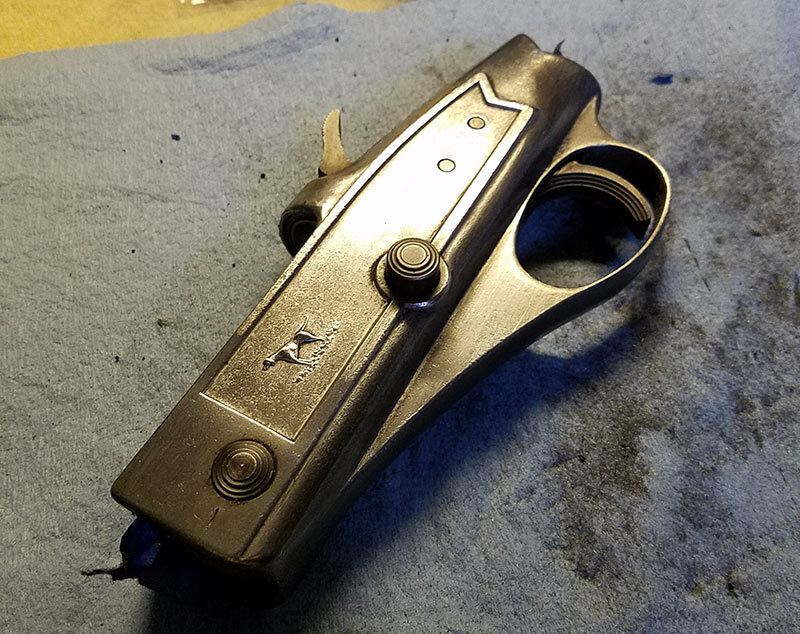 When it found it’s way to me earlier this year I knew I had found something I could sink my teeth into as a project gun. To begin with, there was significant pitting and rust at the front of the barrel. It looked like it had been stored for a while in some kind of muck. Even the upper part of the barrel looked pretty rough. 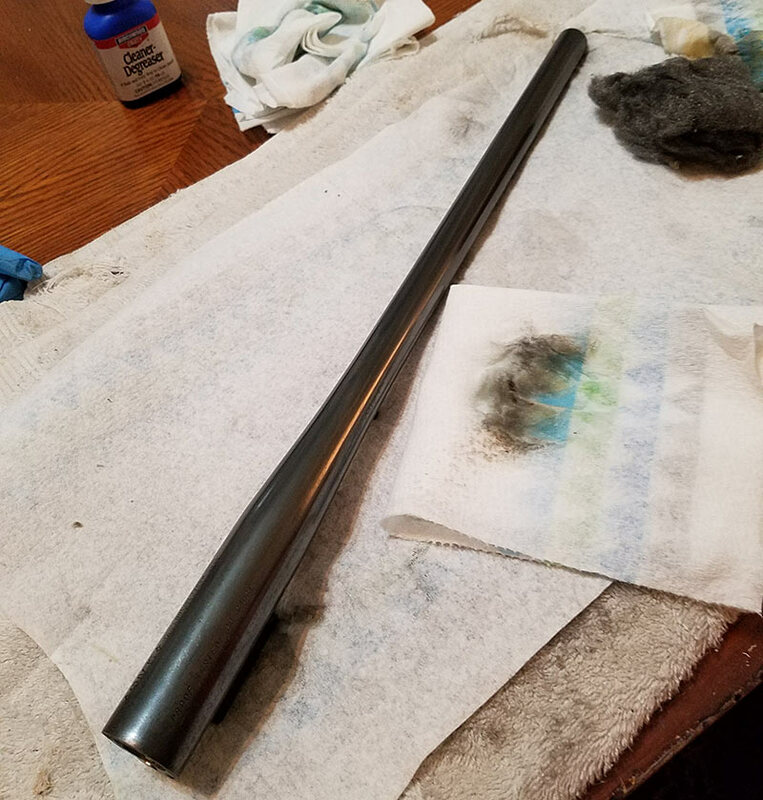 I instantly decided to shorten the barrel to 18.5″ and remove the worst of it. After it was all cut and disassembled the real work began. First came the barrel. All the rust needed to go and I needed to make sure there weren’t any actual holes in it. A little cold-bluing later and the whole thing looked 100 percent better. 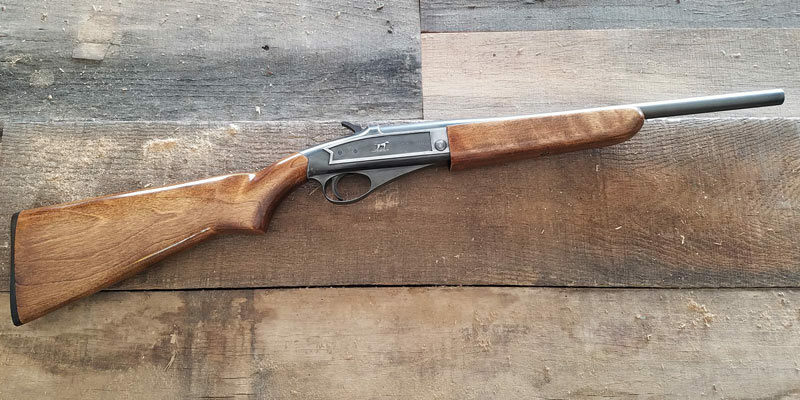 The stock and forend looked beat-up and faded but underneath the wood was in good shape. I chemically stripped them and put a nice looking walnut stain on them which brought the color to a nice medium brown. It may not look it yet but we are well on our way here. Six coats of Tru-Oil make everything look good – even 50+-year-old wood that’s been mistreated all its life. (pictured above is the sixth coat before final buffing) To be fair the original factory finish did take all that abuse and still kept the wood relatively safe. Still, it looks better to me all shiny. The receiver looked pretty bad with worn black paint. 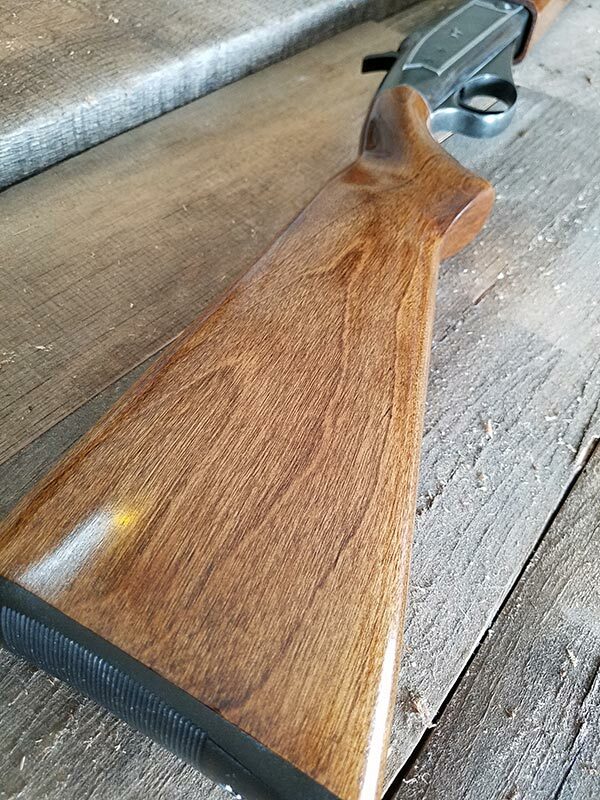 The easy call would have been to re-black it and the barrel but this gun needed some pop to go with the revitalized lumber. So the paint was stripped and the entire receiver buffed clean. The stock which was as hum-drum as it got but after a little care looked great. 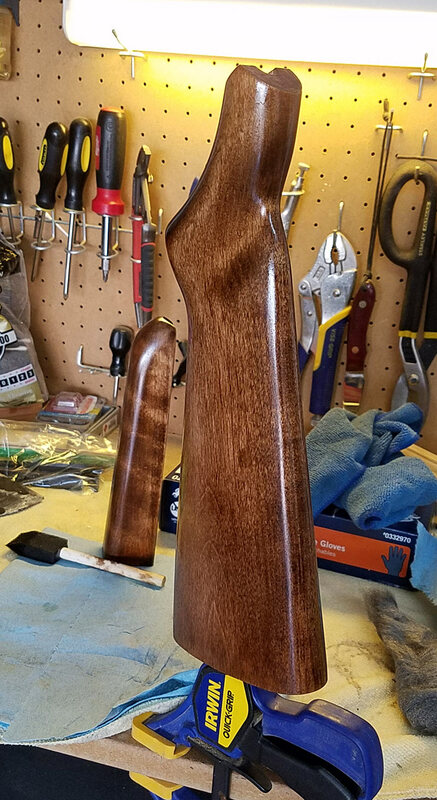 I cold-blued the receiver and decided that it still looked plain next to the stock and forend so I polished and buffed out the raised frame design and the Labrador on either side. The result was nothing short of transformative. 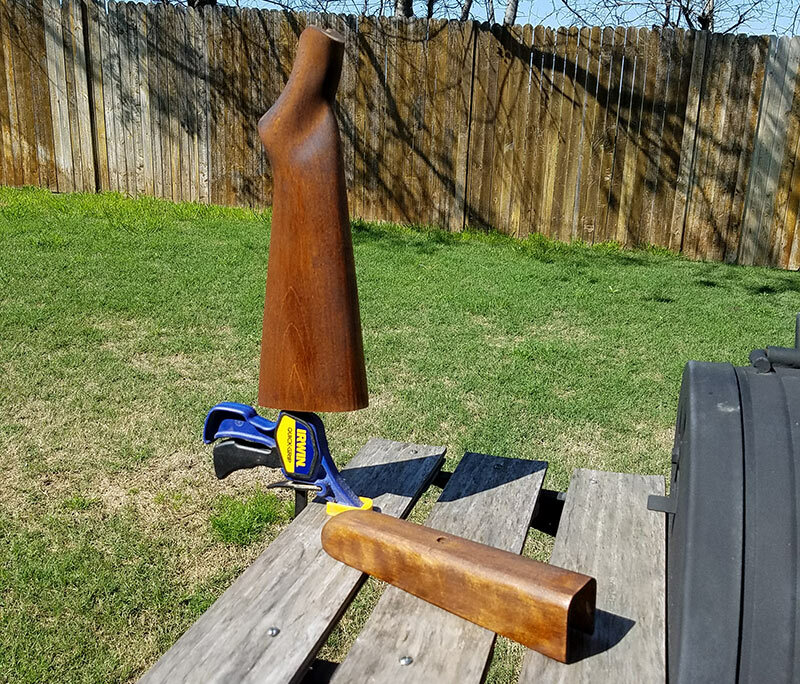 A rather plain firearm to begin with now has a lot more character. With the short barrel, this little guy is now on snake duty. However, it’s still in active service in rural Texas as it has been all its life.